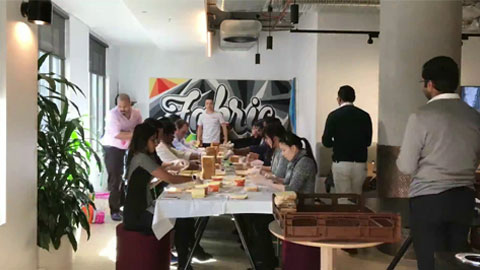 Watch our Melbourne colleagues make a difference one sandwich at a time by volunteering for Eat Up, an organisation that helps feed less fortunate school kids. The team prepared an average of 13 sandwiches every minute in an hour, making a total of 800 lunches for the day! See how Communications, Media & Technology Managing Director Andrew Sethumadavan helped Tex Mackay build ReelAir Imagery from the ground up. 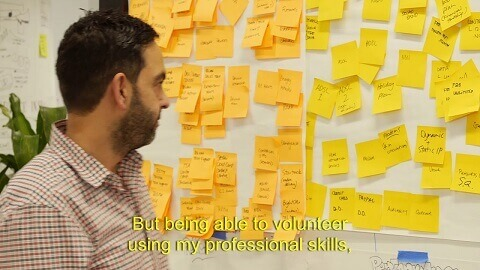 As a volunteer for Many Rivers, a nonprofit that helps marginalised entrepreneurs realise their dreams, Andrew mentored Tex on how to set up his business, get clients and keep everything flowing. We recently welcomed Australian Business and Community Network (ABCN) to our Corporate Citizenship's Skill to Succeed program. 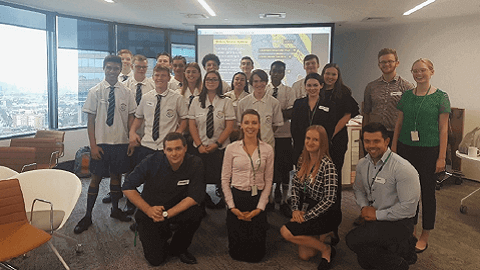 To kick off the partnership, we hosted Interview 2 Impress (i2i) workshops at our Brisbane, Melbourne and Sydney Accenture offices in Australia. i2i workshops provide our people with an opportunity to mentor young students and help them build the confidence and skills to ace job interviews. 26 Accenture volunteers ran three i2i workshops, skilling up to 60 students. Simone, Lexi and Anastasiya were three of the volunteers who took the time to volunteer for the workshop and shared their eye-opening experience. “We started off with learning the basics of communication and confidence. We ran through a series of ice-breaker activities with the students, my favourite being the “Power Pose”, a technique used by social psychologist Amy Cuddy to involve confidence which we applied to building confidence before role playing job interviews,” shared Simone, who joined the Melbourne workshop for students of Hume High School. For Lexi, who volunteered in Brisbane, ABCN stood out to her because she’s passionate about helping young people. Lexi and Anastasiya, together with six volunteers, mentored students from Redbank Plains State High School. They spent the day with the basics including shaking hands, holding eye contact, and having good voice projection and posture. After this, they proceeded to lessons on things to say and not to say during job interviews, and then went on to role play interview practice. Financial inequality is one of the world’s most pressing societal problems. That’s why a cross-continental, collaborative Accenture team came together with a simple yet challenging ambition: to change philanthropic behaviour by offering a positive alternative to disposable spending. How? Our team brought their user experience design and mobility excellence to non-profit organisation, Good Return. Using a human-centred design approach, they opened Good Return’s eyes to new and innovative ways of engaging donors. By starting with a simple question, “What could you give up for a good to cause?," they realised we could all give more then we currently do. We just need a simple means of doing so—and something to trigger our giving. The result was Happytap. This is a mobile app which acts like a digital piggy bank. It intercepts moments of impulsive spending, asking the user to forego non-essential purchases and instead lend the money to women in need in the Asia Pacific region. The money will go towards a small loan to start or grow a microenterprise, and support for family and community. The loan is used for a wide range of commercial and household purposes, facilitated by Good Return (our microfinance partner). Our ambition is now to expand it to a wider audience and a larger number of investment regions—and tap into global goodwill for a good cause. Watch this short video to hear Happytap co-creators Brett Thompson and Hanne Trafnik talk about why they created Happytap and how it works. Youth unemployment is one of the biggest challenges facing Australia today, with almost one-third of young Australians unemployed or underemployed. At Accenture, we realised that our learning and technology expertise put us in a unique position to help with this problem. How? In 2016, we launched the Skills to Succeed Academy, a free, highly interactive online training program that helps disadvantaged young people between the ages 15 and 24 develop the key employability skills they need to find work. The character-based program engages young people by using the latest multi-media and interactive techniques, including gaming, role-based simulations and videos. Advice from employers, job advisors and other successful young people consolidate the interactive components, ensuring a comprehensive training. The Academy has already helped more than 50,000 young people in the UK—and we’ve established a foundation to make a similar impact in Australia. To reach the young Australians who are most in need, we’ve teamed up with youth employment support programs run by major Australian non-profits. Since November 2016, over 20 of them have incorporated the Skills to Succeed Academy into an existing training program or as standalone program, ensuring hundreds more young people have the skills required to enter the modern workplace. Having a great idea for a business is one thing. But finding the knowledge, resources and support to turn that idea into a reality is a much bigger challenge. We believe in the rejuvenating effect that thriving businesses can have on our society and communities. And our people have the expertise to help ensure that small business owners have the skills they need to be successful. That’s why we’ve partnered with Many Rivers on their Mentor Program, which supports small business owners to start and expand their enterprises. To show our commitment to the program, the Accenture Australia foundation is providing multi-year funding to set up and run a mentoring program. Our people have been working as mentors for the scheme, sharing their considerable business experience and expertise with participants. With the assistance and knowledge of our mentors, small business owners across Australia will continue to realise their dreams of owning their own, self-reliant businesses. Making an impact with digital thinkingThrough digital innovation, we aim to help disadvantaged students aspire for a better future. The team above who worked with ABCN on this initiative, enjoying a team get together. There are more than a million disadvantaged students across Australia. Forty percent of students from the lowest socio-economic backgrounds don’t finish school, and by age 24, they are twice as likely to be unemployed. To help address this issue, our team of strategists partnered with the Australian Business and Community Network (ABCN) to think digital—finding ways to deliver mentoring to more students across Australia, arresting the continuous cycle of disadvantage. ABCN’s vision is for all young people to exceed their potential in the future world of work, regardless of background. They act as an intermediary between businesses and students to achieve this vision, delivering mentoring programs and workplace experiences that develop students’ skills and mindsets, aspirations and connections. Innovation is the key to unlocking ABCN’s growth and impacting the lives of more students across Australia. But for an organisation wholly focused on impacting the lives of disadvantaged students, it’s hard to find the time and resources to continuously seek innovation. That’s where we came in. We made it our mission to give ABCN a chance to dream – to dream of a future where they could impact the lives of every disadvantaged student in Australia, and delight students with leading-edge technology. And we put our words into action. To show ABCN that emerging technologies are accessible, we took a virtual reality (VR) headset with us to a design thinking workshop at Blacktown High School. We had the opportunity to delight students with a VR experience and inspire ABCN around the possibilities of VR in their programs. We were amazed at the incredible digital ideas students came up with in this design thinking workshop. Who knew there was a place for Assassin’s Creed in mentoring our next generation of professionals? By collaborating with ABCN, we worked with our counterparts in law firms, consultancies, banks and industry to ensure we build the biggest impact for ABCN—building new relationships and partnerships along the way. We brought together the best of Accenture across the world to help expand our thinking. We committed to continuing the transformation journey with ABCN, laying down a clear path forward with new digital-first concepts. Best of all, we could see the impact our project was making. If we can help even one more student be inspired to exceed their potential, then that’s a win in our books. Accenture may be known for its strategic approach to social innovation, but that doesn’t mean our people are not afraid to roll up their sleeves and get hands-on to provide practical help. In June, our Leadership Team volunteered for the Cooking for a Cause program at non-profit OzHarvest. Working with professional chefs, our team got involved cooking healthy meals for vulnerable people in and around Sydney. This, however, is not a one-off: Throughout the year, hundreds of our people have volunteered with OzHarvest, Australia’s leading food rescue organisation, which feeds vulnerable people across the country with quality surplus food that would otherwise be sent to landfill. Volunteers from Accenture have taken up a variety of volunteer roles. For example, some of our people have volunteered as OzHarvest van assistants, getting hands-on in the field by helping with the daily run of food pick-ups from donors and deliveries to recipient charities, seeing first-hand the impact of food rescue operations. We‘re always looking to support innovative ways to combat inequality. That’s why we have partnered with Good Return, an initiative run by World Education Australia. They envisage a world without poverty, where people have access to resources and opportunities to improve their own lives. They are working towards this vision through responsible microfinance and skills development, where they enable people living in poverty to grow their incomes and change their lives sustainably. Good Return’s team is small, but their mission is big: an end to extreme poverty by 2030. To help achieve this, we’ve teamed up with them to help make their vision a reality: The Good Return White Paper workshops held in Sydney and Melbourne in August saw a total of 39 of our people provide strategic guidance and advice to Good Return, to help in their efforts to eradicate poverty and inequality. Our team offered their insight into the possibilities for offering social investment options through the Good Return peer-to-peer funding website, as well as other digital channels. The workshops allowed our people to exchange vital information and innovative ideas with the team from Good Return and to use their skills to assist people out of poverty. Everyone deserves the best possible start in life and at the heart of our core values is a commitment to stewardship. Poverty is still a major problem in Australia, affecting one in seven children. The Smith Family is a national children’s charity working to combat the impact of poverty on children in Australia. As part of our commitment to make the world a better place for future generations, we collaborated with The Smith Family to help disadvantaged young people break out of the cycle of poverty. We know the enormous role that technology can play in improving the world. The technology revolution is transforming our world and is occurring at an unprecedented speed. For non-profits like Many Rivers—an organisation that supports aspiring business owners with micro-enterprise development support and access to finance—keeping up to date with new technologies might be the key to continuing and enhancing the positive impact they have on Australian society. To help Many Rivers continue their important and transformative work, a joint Accenture & Avanade team are providing their expertise to address a key issue that Many Rivers were facing: their current systems were outdated and due for decommission. The Accenture & Avanade team are working to ensure that Many Rivers is best placed to flourish in the coming years, saving them money, making them more independent and increasing their potential to provide vital assistance to hundreds of small businesses across Australia. As part of the solutions created by the team, Many Rivers will obtain control over their own cloud-based systems. This will allow them to adjust systems to best suit the changing demands of their business. With the new interface, Many Rivers will be able to spend more time interacting with clients and businesses, ensuring they continue their inspiring work of helping people and communities across Australia. Sometimes, first impressions do really count. For women seeking to break into the world of work, looking and acting the part can be a real confidence booster along with having the skills to succeed. And that’s the philosophy behind Dress for Success. Our partnership with Dress for Success is helping to ensure that women in Australia have the skills and resources to thrive in work and in life. Dress for Success aims to help women break from the cycle of poverty and achieve economic independence. Accenture’s partnership with the non-profit began in 2011, when it helped launch its Career Support Program, which provides women with the opportunity to attend employability skills workshops and receive career development guidance. The partnership has strengthened since, with the Career Support Program now established at Dress for Success affiliates across Australia. Our people have volunteered their time and skills to support the goals of Dress for Success, delivering skill-building workshops, assisting at fundraising events and even donating work appropriate clothing. Together, Dress for Success and Accenture are helping women in need can take control of their lives. We have all been guilty of wasting food. But what if there was a way of making sure your non-perishable food waste could be put to good use? Now there is. In March, a small team from Accenture Sydney volunteered with OzHarvest, helping to set-up Australia's first ever free supermarket, The OzHarvest Market. The premise is simple. People often throw away food that is still usable, so why not give this food to those who need it? The OzHarvest Market is a rescued food supermarket, stocked with produce that has either been donated or would otherwise go to waste. Its purpose is to make rescued food available to everyone, especially those who need it most, free of charge and on a "take what you need, give if you can" philosophy. The team began the day by clearing out an old, run-down restaurant in the Kensington suburb of Sydney, re-using materials to make shelves and storage and stocking them with rescued food. They also wrote guides for customers and staff on how the supermarket works, to ensure every visitor will understand its mission. In turn, the OzHarvest team taught the volunteers from Accenture a great deal about their aim to address food security and education. The group left the day grateful for the lessons they had learnt and more aware of the problems of food waste. With the OzHarvest Market now fully operational, Accenture people continue to volunteer their time to help with the daily stocking and packing of food for those who need it the most. The simplest ideas can sometimes have the biggest impact. The non-profit FareShare want to fight hunger and tackle food waste. The latter provides a solution to the former: FareShare recycles food waste to make meals for those most in need. For several years, Accenture’s been supporting FareShare in Melbourne by providing teams of people to cook healthy meals in their kitchen. In doing so, this contributes towards our own commitment towards improving the environment. Every day, FareShare cooks up to 5,000 free nutritious meals for charity by using quality food from supermarkets, farmers and other businesses that would otherwise be wasted and end up in landfill. They then distribute this food to Victorian charities. Recently a team from Accenture volunteered with FareShare, giving them the chance to contribute to the community while fostering their teamwork skills. For many of the volunteers, it was their first time in a commercial kitchen. Yet this hardly hindered their productivity. Working with the FareShare staff, the team from Accenture cooked 1800 Quiches, chopped 1500 carrots, diced 500 tomatoes, shredded 100 loaves of bread for breadcrumbs, feeding 2000 people, all of which were than distributed to food charities around Victoria. This exercise was not a one-off: every year hundreds of Accenture people band together to volunteer at FareShare, and do their bit to eradicate hunger. Rapid advances in technology are helping businesses expand and become more efficient. But they also create a problem: with the latest digital developments, electronic equipment quickly becomes obsolete. Businesses have an obligation to dispose of their electronic waste (e-waste) responsibly, and at Accenture we take our environmental stewardship very seriously. Globally, more than 99 percent of our end-of-life equipment were disposed of by methods avoiding landfill, primarily through supplier reclamation and responsible disposal vendors. To ensure that we continue our strong track record of responsible e-waste disposal, we’ll continue to encourage recycling in the workplace. It’s with this in mind that we support an initiative being pioneered by the Australian mobile phone industry. Our employees can recycle their unwanted personal mobile phones and accessories through the free mobile phone recycling program MobileMuster. This program is the Australian mobile phone industry’s way of ensuring mobile phone products avoid landfill and are instead recycled in a safe, secure and ethical way. World Environment DayCelebrating our wonders of the world - including marine turtles! Without a healthy environment, we cannot end poverty or build prosperity. We are committed to safeguarding the environment. This is why the UN’s World Environment Day (WED) is so important to us. Taking place on 5 June every year, WED encourages worldwide awareness and action for the protection of our environment. In 2017, we supported WED and its theme "Connecting People to Nature" by providing our people with ways to explore their local environment and take part in an environment volunteering activity. Our Melbourne office foyer was turned into a small forest with several trees, reminding our people about the importance of immersing ourselves in nature! In 2016, the WED theme "Go Wild for Life" encouraged us to acknowledge and celebrate all those species that are under threat and to act to help safeguard them for future generations. The messages that emerged from WED were clear. Climate change and environmental sustainability present challenges, but also opportunities for us and our stakeholders. To ensure that these challenges are confronted and opportunities taken, we have committed to incorporating leading environmental practices into our business strategy and operations and to fostering environmental awareness and responsibility among our employees, clients and suppliers. Women face many barriers to pursuing careers in science, technology, engineering and mathematics (STEM). Tech Girls Are Superheroes is a non-profit organisation working to encourage more young women into STEM. As part of our own commitment to female empowerment in the workplace, we have partnered with the Tech Girls to prepare the next generation of talented women to use technology to change the world. Taking place on 5 June every year, WED encourages worldwide awareness and action for the protection of our environment. As part of our collaboration with Tech Girls, Accenture people have been mentoring teams of girls to build their confidence with technology, learn entrepreneurial skills and make a difference in their communities. Tech Girls invite teams of girls from schools across Australia and New Zealand to solve real-world problems through technology. The young women work with their Accenture mentors to identify the challenge they want to solve, conduct market research, write a business plan, code and test their app and create pitch videos to sell their idea. We have pledged to having a 50 per cent female workforce by 2025. By working with the Tech Girls -, Accenture demonstrates its commitment to encouraging women to pursue higher education and careers in STEM.